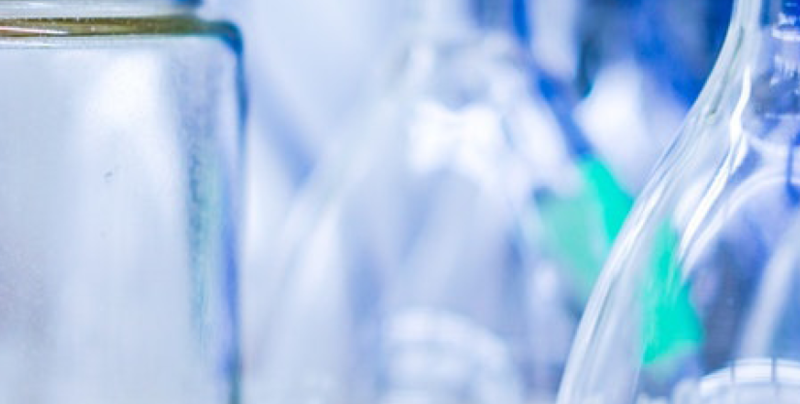 In some previous posts I have discussed strategies and tactics designed with optimizing separations of ionic / ionizable compounds, organic amines, and other hard-to-separate mixtures, each requiring some different purification approaches. In some ways, dealing with ionic / ionizable compounds or organic amines is “easier” because, by and large, you know what you are dealing with and can adjust pH and / or buffer content to get the desired result. The more challenging situations occur when your need to separate / purify structurally similar compounds or compounds with similar hydrophobicity / polarity. In these cases, a combination of changes may be in order. In one case I used TLC with DCM / 10% MeOH to separate a sample with three components including butyl paraben, methyl paraben, and 4-methyl-4(5)-nitroimidazole. Although they separated by TLC in this solvent mixture (Figure 1), they did not separate fully during the subsequent flash purification step (yielded only two peaks), Figure 2. Figure 1. TLC of methyl paraben, butyl paraben, and 4-methyl-4(5)-nitroimidazole using 10% methanol in DCM. Figure 2. DCM-MeOH purification of butyl paraben, methyl paraben and 4-methyl-4(5)-nitroimidazole. Due to methanol’s strong polarity the two parabens co-elute even though there was separation using TLC. The parabens are structurally similar differing by only the ester size and both containing a hydroxyl group in the para position. 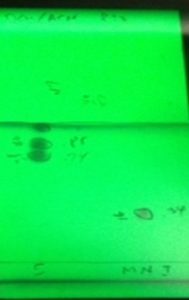 So, in an attempt to get a separation, I replaced methanol (a very strong displacing solvent in normal-phase) with aprotic acetonitrile which then allowed the parabens to separate on TLC as well as with flash chromatography, Figures 3 and 4. Figure 3. TLC of methyl paraben, butyl paraben and 4-methyl-4(5)-nitroimidazole using DCM with 20% MeCN as eluting solvents. Figure 4. DCM-ACN gradient purification of butyl paraben, methyl paraben and 4-methyl-4(5)-nitroimidazole. The paraben separation is due to the replacement of methanol, a protic solvent, with acetonitrile, an aprotic solvent. In another previous post, I discussed a purification challenge that required me to incorporate a third organic solvent into my binary gradient in order to separate some co-eluting compounds from other closely-eluting neighbors. In this case I was trying to separate and isolate terpenoids in lavender oil using a mass detector to find and fractionate the compounds. What I found was one compound with a detected m/z of 203 would co-elute with at least one other mass-detectable terpenoid regardless of the binary mobile phase, either hexane/ethyl acetate or hexane/DCM. The commercially available lavender oil I used (brand Aura Cacia) came from the species Lavendula angustifolia and contains many terpenes and terpenoids. From research, I discovered the most prevalent mass-detectable (oxygen-containing) terpenoids in lavender are linalool and linalyl acetate¹. Other terpenoids typically found in lavender in relatively high abundance include borneol, caryophyllene oxide, geraniol, terpineol, and carvomenthenenol, Figure 5. Figure 5. Some common terpenoids found in lavender. Based on various isoprene unit forms and with similar hydrophobicity, these compounds can be challenging to separate. In the case of the hexane/ethyl acetate gradient, borneol (detectable m/z 196) co-elutes with linalyl acetate (detectable m/z 137) but caryophyllene oxide (detectable m/z 203) is partially resolved. The other main terpenoid, linalool (detectable m/z 137), is fully separated, Figure 6. Figure 6. Lavender purification using a simple 0-15% ethyl acetate in hexane mobile phase provides a separation between linalyl acetate and linalool. Caryophyllene oxide (m/z 203) is partially separated but borneol (m/z 196) elutes with linalyl acetate. So, to try and improve the separation, I weakened the gradient by replacing ethyl acetate with DCM. 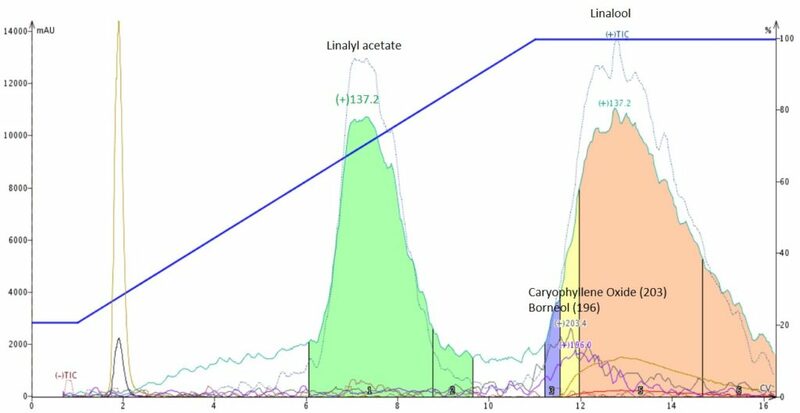 To get the major compounds to separate I found a gradient of 20-100% DCM worked but, both borneol and caryophyllene oxide co-eluted with linalool, Figure 7. Figure 7. 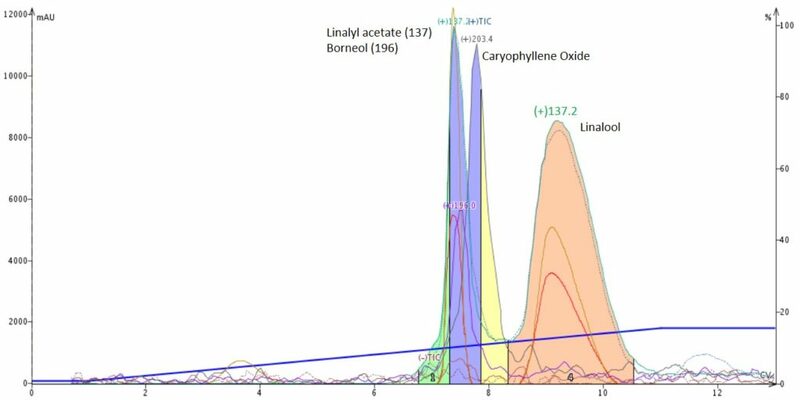 Lavender purification using a 20-100% DCM in hexane gradient separates the two major terpenoids but caryophyllene oxide and borneol co-elute with linalool. Since both borneol and caryophyllene oxide retention and selectivity change when the strong solvent (EtOAc or DCM) changes, I created a method incorporating all three in an effort them to separate from each other and the other terpenoids. After some trial runs, I settled on a step gradient of 0-10% DCM with a 2% EtOAc modifier added isocratically by my Biotage® Isolera Dalton 2000 system. This “ternary” gradient provided a complete separation of linalyl acetate (separated as two peaks – isomers? ), caryophyllene oxide, and linalool with borneol partially resolved from linalyl acetate, Figure 8. Figure 8. Lavender purification using three solvents – hexane, dcm, and ethyl acetate, partially separates m/z 196 (borneol) from linalyl acetate, which splits into two peaks, and caryophyllene oxide, m/z 203. So, by experimenting with different mobile phases and eventually adding a third solvent, I was able to separate caryophyllene oxide from borneol, linalyl acetate, and linalool. How have you addressed challenging purifications such as these? Please, let us know. in Cosmetic Products. JOTCSA 2017, 4(1): 283-298. Hexane EtOAc is the solvent system we use most of the time for flash. Don’t know why but it does seem to be the most successful. If it doesn’t look promising by TLC then I would try a selection of other solvent mixtures but this can be time consuming so I would look at the reverse phase mass spec result to see if there is potential for reverse phase flash. Isomers tend to be the greatest challenge and I am told that normal phase is best here. Certainly normal phase offers a choice of many solvents to use for increased selectivity. If separation factor is 1.1 or less then I need a high performance column. 1.2 is a difficult separation but maybe a small particle size flash column would do 1.35 is fairly easy. 1.5 is easy. Of course separation factors from TLC might not translate very well to the flash column so I would use a scouting column to match the flash column but this is a lot of work which has to be justified. Normal phase chiral chromatography is often a good way to separate diastreoisomers when all else fails. Many thanks for your input. Hexane-EtOAc is indeed the most popular solvent blend for normal-phase flash. Acetone, I have found, is another good solvent to use with hexane as it typically provides sharper peaks and usually is less expensive than EtOAc with the same selectivity. There is no way you can separate enantiomers on non-chiral column. I would be very surprised if that turned out to be true. I assume it is the problem with chromatography itself leading to split peaks (loading, chemistry, physical, etc). Can you measure optical rotation of the “two peaks” to be sure? I too am skeptical about the possible separation of linalyl acetate enantiomers using silica but, it is worth investigation! I fully agree with Tom. For separation of enantiomers you need chiral stationary phase. Just like you would most probably need to use chiral derivatizing agent for chiral resolution through crystallization. 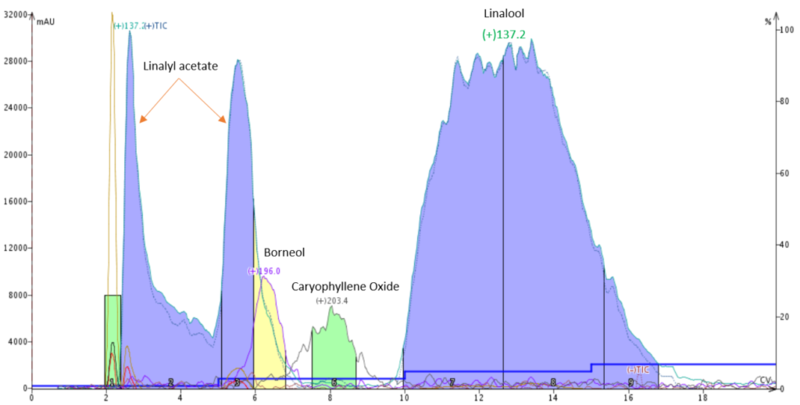 I once had a case when by deactivating a column packed with normal silica with DCM containing 2% of 7N methanolic ammonia prior to FCC, my achiral product was eluted in two peaks: one peak appeared at the beginning of the chromatogram, the other one a bit later, at the gradient that was indicated by TLC. It was probably caused by the fact that after the deactivation, the column was not sufficiently washed with 100% DCM and that remaining traces of MeOH temporarily modified the eluting ability of the mobile phase. It resembles your case: we both had ternary gradient at some point. 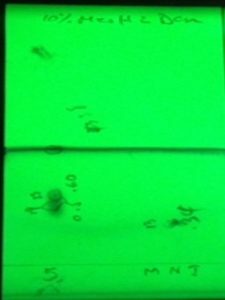 I did investigate further and found the separation was dissociative – basically, some of the compound adsorbed to silica and some did not. So, no chiral separation achieved, just a physical phenomena. Next Next post: How many times can I reuse my flash chromatography column?